Audrey Delia Vega, known to everyone in her family as Nan, died peacefully on Monday, March 25, 2019 at the home of her daughter, Gloria O’Blanc, in Jennings, LA. She was 92 years young. Her life began on June 23, 1926 in Bristol, England, the first of three children born to Thomas and Ellen Rose (McDowell) Shaw. As a youngster growing up in the Barton Hill area of Bristol, she was a teenager when the WWII German air war against Great Britain began. She had vivid memories of running for shelter when the warning sirens sounded, and the bombs came crashing to the ground. After leaving school, she started her first job in a Bristol tobacco factory. As WWII closed, Audrey met Manuel Vega at a dance for U.S. Army service members. During their courtship he would leave the base - sometimes clandestinely -- to visit her and her family. The couple married on Nov. 3, 1945 in Bristol. The Army took them to many locations and soon they had a family of their own. Daughters Gloria and Susan were born in England and Germany, respectively, and then the baby of the family, Philip, followed upon their move to the US. With Manuel leaving the Army in 1952, the couple made their home in Junction City, Kansas. Audrey worked from home, sewing many a young girls’ pep club or high school cheerleader outfit. Later she worked in the St. Xavier School cafeteria. The money made there went into a savings account for her first visit back to England, which she achieved in 1965. Many will remember Audrey from her time at Montgomery Wards. 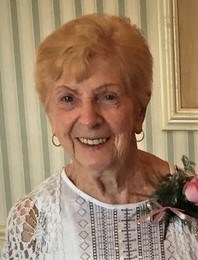 While managing the jewelry department, she made a lasting impression on customers and made many friends and acquaintances. One of her co-workers, on Audrey’s 90th birthday, remembered her as “a great role model, strong, smart, ethical and kind”. Audrey and Manuel were faithful members of St. Xavier’s Catholic Church. They sent their three children to St. Xavier’s Catholic School. Manuel and Audrey were a couple who routinely gave of their time and treasure to support St. Xavier’s and its congregation. The friendships they formed during these years of service lasted their entire lifetimes. As retirees, Audrey and Manuel took many trips abroad, visiting her brother, Bernard Shaw; sister, Jean Stephanides; and their spouses and her parents many times over the years. They often extended those vacations, traveling with Audrey’s family to other European destinations. She made her last trip to England in 2016 to celebrate her 90th birthday where she was feted by her dear sister-in-law Greta Shaw and many family members and guests. Nan was continuously curious about life and wasn’t afraid of technology. Knowing our Nan of the late 1990's and early 2000's, she had a desktop computer and regularly emailed when hardly anyone her age did. She bought a smart phone and she text, checked in with family and friends on Face Book, and liked to surf the internet up until the time of her death. Into her early-80's, Audrey was quite fit and was proud to say she could touch her toes. She went swimming many mornings at the local YMCA with her good friend and neighbor, Helen Edgar. During the last 10 years of her life, Nan had a series of health issues including several strokes. These debilitating events, of course, upset her. But she was always ready to do therapy, or exercises, and had a shirt embossed with the words, “never, never, give up”. Her caregivers always commented on her friendliness and upbeat attitude - and her British accent! Everyone who knew our English Rose will never forget her inner beauty and her kindnesses. She always remembered a birthday, anniversary or other special occasion with cards and hand-written notes. All her caregivers were special to her and the family is grateful for all their efforts during the past few years. They helped her get better and extended her quality of life. Special thanks to her loving caregiver Jessica Simon and to Angela Sherwin, mom’s devoted granddaughter, who spent the last six months tending to her every need both day and night. Everyone who knew our Nan is going to miss her, but she will always live on in our hearts. She was preceded in death by Manuel, her husband of 69 years; a daughter Pamela, who died at child birth; her parents, Thomas and Ellen Shaw, her brother Bernard Shaw, her sister Jean Stephanides and a granddaughter Julia Vega. She is survived by daughters Gloria O’Blanc and husband Alton of Jennings, LA and Susan Filson and husband Jerry of Phoenix, AZ; son, Philip Vega and wife Jolene of Junction City, KS; five grandchildren: Angela Sherwin, of Jennings, LA, Kevin Sherwin, of Junction City, KS, Byron Filson of Phoenix, AZ, Nigel Filson of New York, NY, and Paul Vega of Seattle, WA; five great-grandchildren: Michael, Robyn, Ryan, Austin, and Jared; and five great-great grandchildren: Grace, Allie, Jayden, Audreyanna, and Adalynn; her dear sister-in-law Greta Shaw of Teignmouth, England; and many relatives both in the U.S. and abroad. A vigil service with a rosary will start at 6 p.m. Thursday, April 4, 2019, with visitation to follow at Johnson Funeral Home, 203 N. Washington St., Junction City, KS. A Funeral Mass will be said at 9:30 a.m. Friday, April 5, 2019 at St. Xavier’s Catholic Church, 218 N. Washington St., Junction City, KS, with the Rev. Kyle Berens officiating. Interment will follow at St. Mary’s Cemetery, Junction City, KS. A lunch reception will follow burial at the Knights of Columbus Hall, 126 W. Seventh St., Junction City, KS. Memorial donations can be made in Audrey’s name to St. Xavier’s School, 200 N. Washington St., Junction City, KS 66441. Johnson Funeral Home is handling the arrangements. To leave a special message for the family, please click on the Share Memories button. Add your memories to the guest book of Audrey Vega. Remembering fondly our fun times together at the gift shop with Mrs. Huey. Unfortunately I never had the pleasure of spending much time with my aunt and uncle. As a young man I remember my parents Isidor and Connie Vega taking us to Junction city Kansas on vacation when I was about 12 years old. There are many people that we meet in our lives. But only very few will leave a lasting impression on our minds and our hearts. I found this in my aunt and uncle. It is these people that we will think of often. Condolences to the Vega family. Audrey was a lovely person. I also remember her from Montgomery Wards where she was always friendly and helpful. When I think of Nan, her smile and gracious nature comes to mind first and foremost. She was a beautiful woman inside and out. One of my most special memories of her was when she came to meet her infant great-grandson, Austin for the first time. When she held him in her arms, her whole face lit up with that beautiful smile. I will miss her and I am forever blessed to have known her.